Everyone needs a no-fail, easy to whip up Rum Cake Recipe! They are always a hit – especially this time of year. 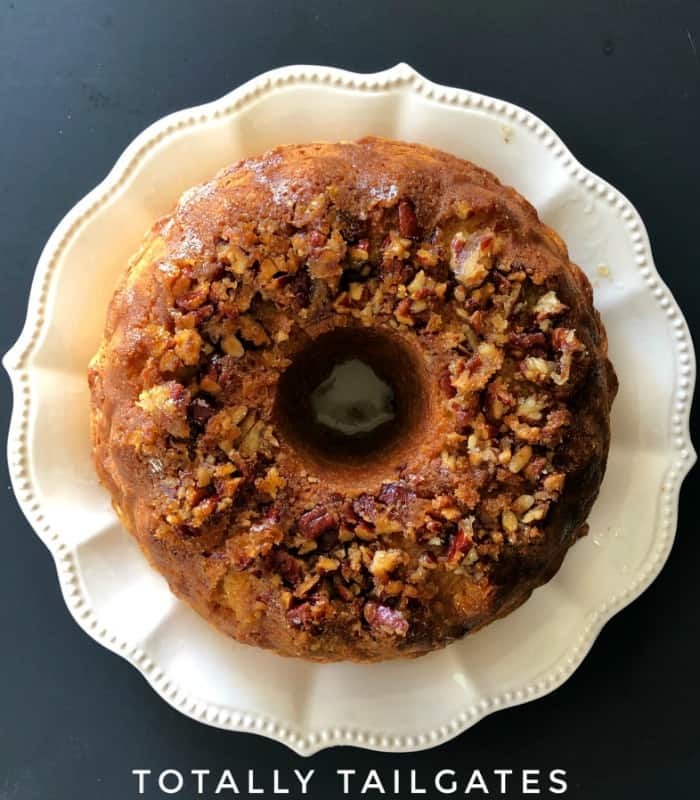 Your sweetheart will certainly appreciate an old fashioned Rum Cake on Valentine’s Day! 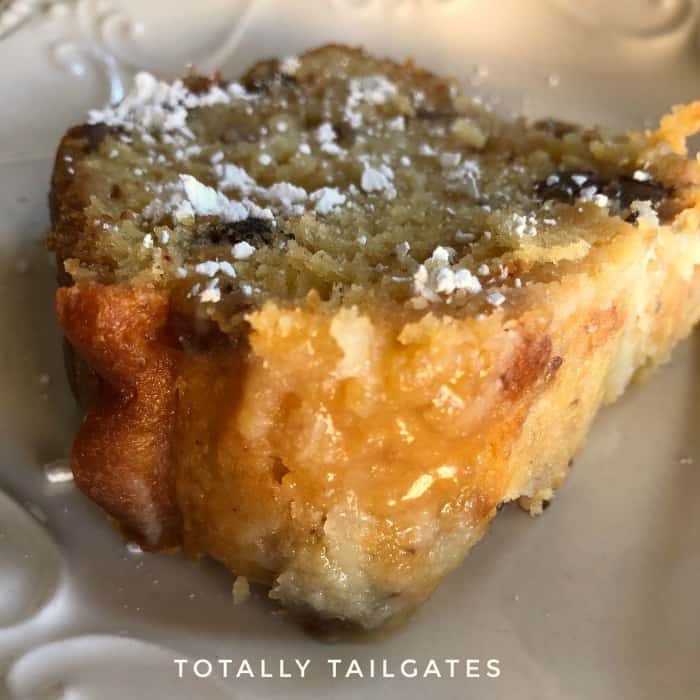 Here’s why this Rum Cake Recipe is my absolute FAVORITE: boxed cake mix & instant pudding are the base of the ingredients! I made several scratch Rum Cakes when Copa & I were newlyweds, only to have the cake turn out less than extraordinary. I gave up on this traditional rum cake recipe until I came across my Great Aunt Amy’s handwritten recipe. She used boxed cake mix & instant pudding to enhance the flavoring and to keep it simple. Lots of her recipes featured instant pudding. I think it must have been such a novelty when it was invented in 1940’s that savvy cooks immediately jumped on the instant pudding band wagon! This Rum Cake Recipe yields a rich, moist cake. Like, seriously good! 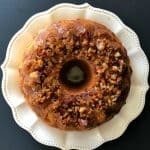 Grease that Bundt pan! Don’t be shy with your new BFF…the non-stick cooking spray! Prick top and sides of the cake many, many times to allow all the yummy glaze to infiltrate the cake. For a super moist cake, I let my Rum Cake come to room temperature after glazing, then I cover the entire cake (top/sides/bottom) with plastic wrap. This seals in the moisture. I let the cake rest like this overnight, and serve the following day. You CAN serve same day, but the cake loves to soak up that rum overnight! Do not over bake this cake! Your cooking time may need to be adjusted based on your pan; black pans need less cooking time. In addition to the boxed mixes, you just need eggs, rum, oil, water, nuts, butter and sugars. That’s it! Great Aunt Amy used imitation rum extract in her original Rum Cake Recipe, which might be an option for you, too. If you are feeling fancy, you can dust each decadent slice with a bit of confectioners sugar. I like feelin’ fancy, so I always break open the box of sugar! Preheat oven to 350 degrees. Spray bundt pan well with non-stick cooking spray, making sure to get all the nooks and crannies. Finely chop the pecans, place them in the bottom of the Bundt pan, and then evenly sprinkle the brown sugar on top of the pecans. Mix yellow cake mix, instant pudding, eggs, water, rum and oil in a large bowl. Pour the batter over the brown sugar/pecan mixture. Prepare the glaze while the cake bakes: melt butter in a medium saucepan and then stir in water & sugar. Bring the mixture to a boil for about 4 minutes, stirring constantly. Remove the glaze from the burner and pour in rum. Stir thoroughly. Return the saucepan to the burner and heat the glaze for a minute or two. When the cake is finished baking, remove it from the oven and pour about 1/3 of the glaze on top of it while it is still warm and in the pan. Let it sit like this for a few minutes. Turn the cake onto a serving platter. Poke the top and sides of the cake with toothpicks or a fork. Repeat this multiple times! Pour remaining glaze evenly on the top and sides of the cake. Let the cake return to room temperature. Cover the cake with a domed cake lid OR cover it entirely with plastic wrap. (The latter method is preferred) and allow the cake to soak in the glaze for a minimum of 2-4 hours before serving. The cake is best if allowed to rest covered overnight. Everyone needs an easy, no-fail Rum Cake Recipe! 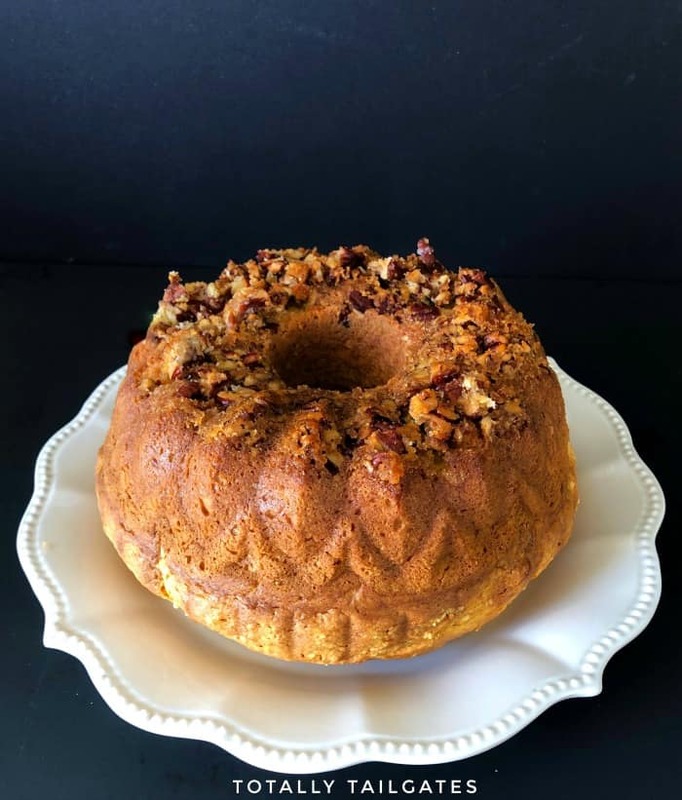 This is the cake your sweetheart will love for Valentine’s Day dessert, and a good Rum Cake is always welcome around the holidays! An easy no-fail rum cake recipe made with minimal ingredients. Spray Bundt pan with non-stick cooking spray, making sure all pan crevices are equally coated. Spray it again for good measure. Finely chop the pecans and place them in the bottom of the Bundt pan. Evenly drop the brown sugar on top of the pecans. In a large bowl, mix together the yellow cake mix, instant pudding, eggs, water, rum and oil. Pour batter over the brown sugar/pecan mixture. Bake the cake for 1 hour - do not over bake this cake! Your cooking time may need to be adjusted based on your pan; black pans need less cooking time. While the cake bakes, prepare the glaze: melt butter in a medium saucepan and then stir in water & sugar. Bring the mixture to a boil for about 4 minutes, stirring constantly. Remove the glaze from the burner and pour in rum. Stir thoroughly. Return the saucepan to the burner and heat the glaze for a minute or two. Turn the cake onto a serving platter. Prick top and sides of the cake with toothpicks or a fork. Repeat this multiple times! Pour remaining glaze evenly on the top and sides of the cake. Let the cake rest, covered & coated in the glaze for a minimum of 2-4 hours before serving. The cake is best if allowed to rest covered overnight. 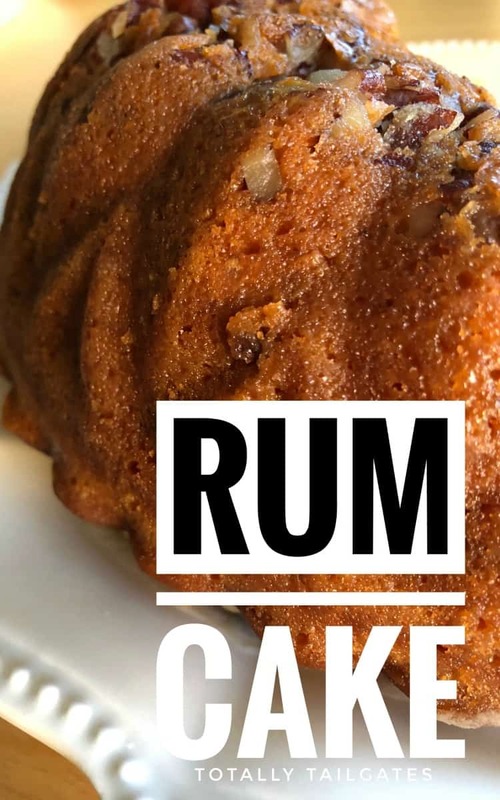 If you liked this Rum Cake Recipe you might also like…. This post was updated December 2019.